FILE - Chinese Police officer poses with Chinese tourists in Milan's Duomo square in Rome, Italy, May 3, 2016. When Chinese President Xi Jinping arrives Thursday in Rome he will not be short of compatriots to exchange pleasantries with in the short amount of sightseeing built into the schedule for his state visit, the first of three stops in Europe, which will take him to France and Monaco, too. Italy’s "eternal city" has been a magnet for increasing Chinese tourism and regardless of season Rome’s Fiumicino airport is crowded with Chinese tourist groups clogging up security gates and the duty-free stores. FILE - Tourists take pictures of Saint Peter's Basilica from Pincio terrace in downtown Rome, Italy, Aug. 3, 2017. The profitable year-round Chinese influx is welcomed by many Italians — the newcomers make up for a dip in tourist numbers since the 2008 global financial crash from the U.S. and Italy’s European neighbors. But Chinese tourism is not, according to some analysts, all that it might seem. Beijing is not shy of using tourism as a tool of statecraft to reward friends and punish critics, Stratfor, a U.S. based geopolitical intelligence company, warned recently. Beijing directs tourism flows by granting countries Approved Destination Status. “This designation regulates where Chinese package tour groups are authorized to go and how tours are marketed in mainland China,” says Stratfor. And that can make a considerable trickle-or-flood difference in the numbers. FILE - Chinese tourists pose for a group photo at the Gyeongbok Palace in central Seoul, South Korea, Oct. 5, 2016. In 2017, Beijing managed to reduce by more than half the number of Chinese tourists traveling to South Korea to punish Seoul for deploying the U.S.-supplied Terminal High Altitude Area Defense missile defense system. Tourism, though, is not at the top of Xi Jinping’s agenda for his stop in Rome. Italy is considering joining Beijing’s global trade and infrastructure program, informally known as the New Silk Road and formally as The Belt and Road Initiative, BRI. 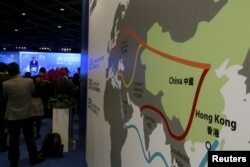 FILE - A map illustrating China's silk road economic belt and the 21st century maritime silk road, or the so-called "One Belt, One Road" megaproject, is displayed at the Asian Financial Forum in Hong Kong, China, Jan. 18, 2016. A giant trillion-dollar trade, investment and infrastructure project, the BRI is Xi Jinping’s signature foreign policy and since 2013 Beijing has already invested nearly $700 billion into more than 60 countries. Much of the investment is in the form of large-scale infrastructure loans to down-at-heel governments and the idea as outlined by the Chinese leader was to draw these countries closer to Beijing while boosting Chinese soft power abroad. Some analysts see a parallel with tourism when it comes to the BRI. The enormous investment project can easily, they argue, be leveraged for political influence — much as China has done on a smaller scale with tourism. In Rome this week, the cash-strapped Italian government is due to sign a memorandum of understanding to participate in Xi’s signature program, allowing China’s interests into sectors like telecoms and ports. Italy would become the first G7 country to participate formally in the BRI. And that is alarming both Washington and EU leaders, who are growing wary of Beijing’s burgeoning clout on a Continent allied to the U.S.
A dozen EU countries, including Bulgaria, Croatia, the Czech Republic, Estonia, Greece, Hungary, Poland, Portugal, Slovakia and Slovenia, have already signed MoUs with Beijing. “On the surface, Rome’s official participation in Beijing’s trillion-dollar venture is purely an economic issue between the two nations. In reality, however, it is not that simple,” according to Xuan Loc Doan, an analyst the Global Policy Institute, a London-based think tank on international affairs. “Some regard it as a strategic tool for Beijing to extend its sphere of influence. For others, instead of empowering participating countries, the scheme puts some of them under huge debt,” he wrote in a commentary. In a recent summit on the New Silk Road, Helmut Scholz, a German member of the European Parliament, noted: “The BRI is often compared to the Marshall Plan. However, the New Silk Road will mainly provide loans, and not grants, unlike the Marshall Plan. It means those loans will have to repaid.” He worries that the BRI will lead countries that take loans into a debt trap, which can then be used for political leverage by Beijing. The European Parliament in September warned that the infrastructure projects under China’s massive program “could create large debts” for European countries that take BRI loans. The country’s prime minister, Giuseppe Conte, has endeavored to walk a middle way, telling the Italian newspaper Corriere della Sera that Italy remains firmly a good friend to the U.S., but he cannot see why that should stop the Italian government from signing an agreement with China. “I think it can be an opportunity for our country,” Conte said. 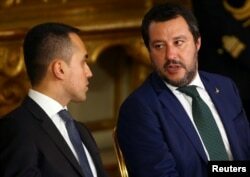 FILE PHOTO: Interior Minister Matteo Salvini talks with Italy's Minister of Labor and Industry Luigi Di Maio at the Quirinal palace in Rome, Italy, June 1, 2018. But trying to have it both ways may not work. Coalition leaders, right-wing populist Matteo Salvini and Luigi Di Maio, the leader of the anti-establishment Five Star party, are ideological bedfellows of the Trump administration. However their willingness to cosy up to Beijing at the same time is adding to their reputation of being contradictory and unreliable, say U.S. officials. “The inevitable result will be a cooling of relations between Washington and Rome,” predicts a U.S. diplomat based in Rome.